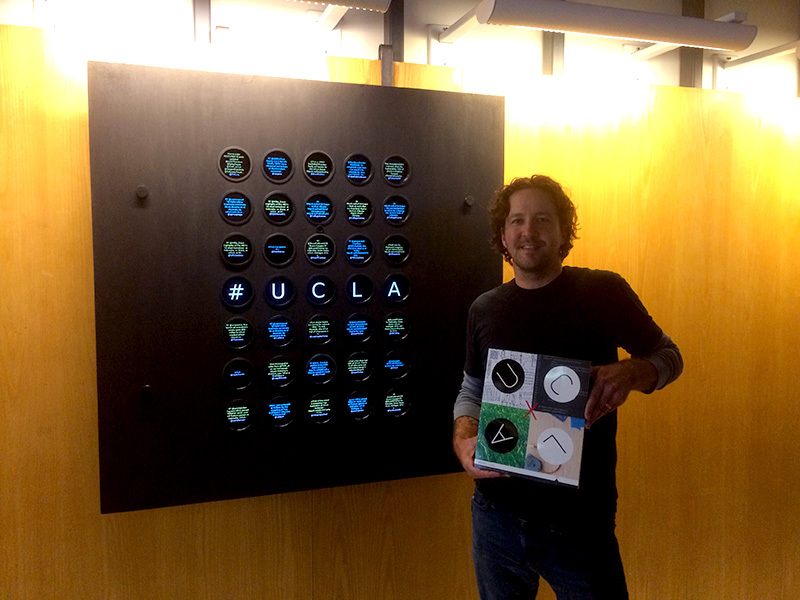 Creative Director and Interactive Developer Michael Newman was tapped by UCLA Extension to design their 2015 winter course catalog cover. To accompany his work, he also designed, developed, and built a Raspberry Pi-powered interactive installation called Thirty-five Pixels which is currently on display at UCLA Extension’s 1010 Westwood building through the 2015 Winter Quarter. Michael Newman along with his installation Thirty-five Pixels in situ. Using the mantra “Play, Learn, Explore, Connect” I have created a framework which abstracts my experiments into a visual experience. First exploring physical media, such as black and white ping pong balls and CNC controlled devices, I iterated through a variety of concepts and ultimately developed a digital mechanism that can display both simple, dot matrix style data, and complex data and images simultaneously. Thirty-five Pixels runs on a Raspberry Pi Model B+ and uses a camera module for motion detection and image capture. The piece is also Internet-connected so that users all over the world can interact with it and control what it displays. It can pull content from Twitter, Instagram, and other media such as past course catalog covers. You can try out the remote interface here and also watch a camera’s view of the piece to see how you have an effect on it. Michael wrote about Thirty-five Pixels on his portfolio site, which I encourage you to look at for technical details and for some of his other fantastic work. “…which I encourage you to look at for technical details and for some of his other fantastic work. We actually had a bit of a problem in the back-end of the website with this post, so it wasn’t possible to comment for about 48 hours – as you can see, though, the comments are back up now! Any news about the Christmas Competition? We’ve received a veritable pile of entries from all over the world. The competition closed on the 10th of January – mentions and announcements are due at the end of the month. Some pointers please.. This is really cool! !